Wild Woods Animal Park will host its 2nd Annual Seneca Native American Festival on September 1, 2007 and September 2nd 2007. On September 1,2007 the Festival will begin at 10:00am and end at 6:00pm. It will reopen September 2, 2007 at 10:00am and end at 6:00pm. The Seneca Native's will have the opening prayer at 11:00am, followed by the day's activities of speakers, dancers, and demonstrators. They will perform twice a day. The Rix Bear Show complements the entire festival, opening with world class German Shepards, three beautiful Black Bears, and a short presentation on how man can co-exist with bears. She will perform twice daily. All the while this is being presented, in the far section of the park, Outback Ray will be performing his "Amazing Reptile Show". He will perform three times a day. Hawk Hide Away Raptor Center will be showcasing its magnificent "Birds of Prey" Program. In the back section of our future trails, a chainsaw carver will carve all day doing various animals for the park. Please refer to "Our Future" page on the web site main page. Various artists will be throughout the park, painting, drawing, and carving on site. This is a true festival in the forest, celebrating everything that is good. 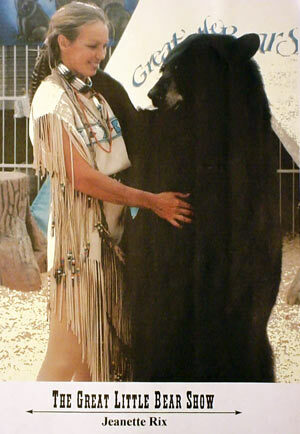 The first native people with the first native animals, we invite you to enjoy. Adults: $18.00 per 2 day. Children under 12: $8.00 per 2 day. All proceeds will go to the building of future exhibits for Wild Woods Animal Park.